Page MovedAll material related to the Community Data Science Workshops have been moved from the OpenHatch wiki to a new dedicated wiki and this page is no longer being updated here. Please visit the new version of the page on the Community Data Science Collective wiki. The Community Data Science Workshops (CDSW) are a series of workshops designed to introduce some of the basic tools of programming and analysis of data from online communities to absolute beginners. The CDSW have been held twice in Seattle in Spring and Fall 2014. So far, more than 30 people have volunteered their weekends to teach more than 130 people to program in Python, to build datasets from Web APIs, and to ask and answer questions using these data. Although no dates have been set and plans might change, we have tentative plans to run another CDSW at some point in the first half of 2014 and likely during UW's Spring quarter. If you'd like to attend to the CDSW either as a participant or as a volunteer mentor, please subscribe to our announcement email list. The list will get no traffic except for annoncements of an upcoming CDSW. The Community Data Science Workshops are a series of project-based workshops for anyone interested in learning how to use programming and data science tools to ask and answer questions about online communities like Wikipedia, Twitter, free and open source software, and civic media. The workshops are for people with no previous programming experience. The goal is to bring together both researchers and academics as well as participants and leaders in online communities. The workshops have all been free of charge and are open to the public. The sessions are schedule for one Friday evening and three Saturdays all day. Each session involves a period for lecture and technical demonstrations in the morning. This is followed by a lunch. The rest of the day consists of self-directed work on programming and data science projects supported by more experienced mentors. Introduction to Programming (Session 1) — Programming is an essential tool for data science and is useful for solving many other problems. The goal of this session will be to introduce programming in the Python programming language. Each participant will leave having solved a real problem and will have built their first real program. Because we expect to hit the ground running, we will also run a session in the evening of the preceeding Friday (Session 0) to help participants get software installed. Importing Data from Web APIs (Session 2) — An important step in doing data science is collecting data. The goal of this session will be to teach participants how to get data from the public application programming interfaces (“APIs”) common to many social media and online communities. Although, we will use the APIs provided by Wikipedia and Twitter in the session, the principles and techniques are common to many online communities. Data Analysis and Visualization (Session 3) — The goal of data science is to use data to answer questions. In our final session, we will use the Python skills we learned in the first session and the datasets we’ve created in the second to ask and answer common questions about the activity and health of online communities. We will focus on learning how to generate visualizations, create summary statistics, and test hypotheses. Are new contributors to an article in Wikipedia sticking around longer or contributing more than people who joined last year? Who are the most active or influential users of a particular Twitter hashtag? Are people who participated in a Wikipedia outreach event staying involved? How do they compare to people that joined the project outside of the event? Our first session was originally modeled after the Boston Python Workshop but most our curriculum is brand new and has been developed and modified by the mentors and with feedback from the participants. A number of people have expressed interest in putting on their own CDSW or using our curriculum. 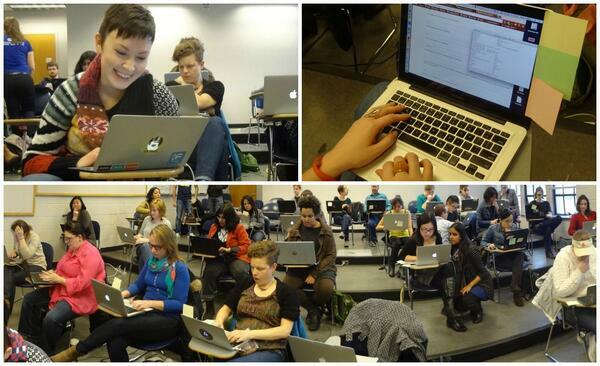 For example, the Python Workshops for Beginners organized in Waterloo in Fall 2014 were largely based on our curriculum. Curriculum for the workshops have been developed by Benjamin Mako Hill, Ben Lewis, Frances Hocutt, Jonathan Morgan, Mika Matsuzaki, Tommy Guy. The events are only possible with the help of a long list of over 40 volunteer mentors across the two events. The workshops have been designed with lots of help and inspiration from Shauna Gordon-McKeon and Asheesh Laroia of OpenHatch and lots of inspiration from the Boston Python Workshop. Our previous workshops have with space and funding by the University of Washington Department of Communication and the eScience Institute. If you have any questions, contact Benjamin Mako Hill at makohill@uw.edu. This page was last edited on 15 March 2015, at 21:44.